Synthetic peptide corresponding to Human Aquaporin 3 aa 278-292 (C terminal). WB: Rat kidney, mouse lung and mouse kidney tissue lysates. IHC-P: Rat kidney tissue. ICC/IF: formaldehyde fixed MCF-7 cells. Our Abpromise guarantee covers the use of ab125219 in the following tested applications. WB Use a concentration of 0.1 - 0.5 µg/ml. 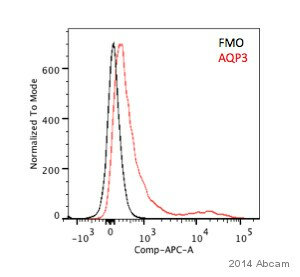 Predicted molecular weight: 31 kDa.Can be blocked with Aquaporin 3 peptide (ab195690). The detection limit of ab125219 is approximately 1ng/lane under non-reducing and reducing conditions. IHC-P Use a concentration of 0.5 - 1 µg/ml. Perform heat mediated antigen retrieval before commencing with IHC staining protocol. Flow Cyt Use 1-3µg for 106 cells. IHC-Fr Use a concentration of 0.5 - 1 µg/ml. Water channel required to promote glycerol permeability and water transport across cell membranes. Acts as a glycerol transporter in skin and plays an important role in regulating SC (stratum corneum) and epidermal glycerol content. Involved in skin hydration, wound healing, and tumorigenesis. Provides kidney medullary collecting duct with high permeability to water, thereby permitting water to move in the direction of an osmotic gradient. Slightly permeable to urea and may function as a water and urea exit mechanism in antidiuresis in collecting duct cells. It may play an important role in gastrointestinal tract water transport and in glycerol metabolism. Widely expressed in epithelial cells of kidney (collecting ducts) and airways, in keratinocytes, immature dendritic cells and erythrocytes. Isoform 2 is not detectable in erythrocytes at the protein level. Basolateral cell membrane. In collecting ducts of kidney. ab125219 at 1µg/ml staining Aquaporin 3 in Paraaffin-embedded Rat kidney tissue by Immunohistochemistry. Immunohistochemistry (Formalin/PFA-fixed paraffin-embedded sections) analysis of Human Lung Cancer Tissue labeling Aquaporin 3 with ab125219. Overlay histogram showing Hela cells stained with ab125219 (Blue line).The cells were blocked with 10% normal goat serum. And then incubated with rabbit anti-Aquaporin 3 Antibody (ab125219,1μg/1x106 cells) for 30 min at 20°C. DyLight®488 conjugated goat anti-rabbit IgG (5-10μg/1x106 cells) was used as secondary antibody for 30 minutes at 20°C. Isotype control antibody (Green line) was rabbit IgG (1μg/1x106) used under the same conditions. Unlabelled sample (Red line) was also used as a control. Immunohistochemistry (Formalin/PFA-fixed paraffin-embedded sections) analysis of Human Renal Cancer Tissue labeling Aquaporin 3 with ab125219. 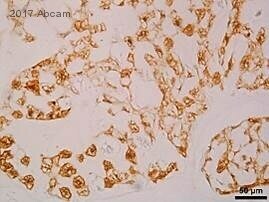 Immunohistochemistry (Frozen sections) analysis of Rat Kidney Tissue labeling Aquaporin 3 with ab125219. Immunocytochemistry/ Immunofluorescence analysis of HeLa cells labeling Aquaporin 3 with ab125219. Aquaporin 3 was immunoprecipitated using 0.5mg Mouse Kidney extract, 5µg of Rabbit polyclonal to Aquaporin 3 and 50µl of protein G magnetic beads (+). No antibody was added to the control (-). The antibody was incubated under agitation with Protein G beads for 10min, Mouse Kidney extract lysate diluted in RIPA buffer was added to each sample and incubated for a further 10min under agitation. Proteins were eluted by addition of 40µl SDS loading buffer and incubated for 10min at 70oC; 10µl of each sample was separated on a SDS PAGE gel, transferred to a nitrocellulose membrane, blocked with 5% BSA and probed with ab125219. ICC/IF image of ab125219 stained MCF-7 cells. The cells were 4% formaldehyde fixed (10 min) and then incubated in 1%BSA / 10% normal goat serum / 0.3M glycine in 0.1% PBS-Tween for 1h to permeabilise the cells and block non-specific protein-protein interactions. The cells were then incubated with the antibody ab125219 at 5µg/ml overnight at +4°C. The secondary antibody (green) was DyLight® 488 goat anti- rabbit (ab96899) IgG (H+L) used at a 1/1000 dilution for 1h. Alexa Fluor® 594 WGA was used to label plasma membranes (red) at a 1/200 dilution for 1h. DAPI was used to stain the cell nuclei (blue) at a concentration of 1.43µM. Publishing research using ab125219? Please let us know so that we can cite the reference in this datasheet.